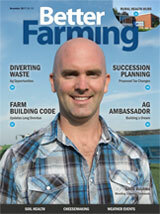 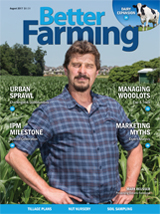 Better Farming November 2017 edition features David Buurma on the front cover and the following articles: Diverting Waste - Ag Opportunities, Succession Planning - Proposed Tax Changes, Farm Building Code - Updates Long Overdue, & Ag Ambassador - Building a Dream. 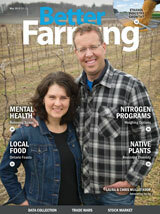 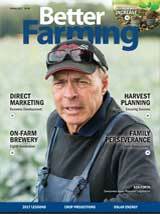 Better Farming October 2017 edition features Ken Forth on the front cover and the following articles: Direct Marketing - Business Development, On-Farm Brewery - Eighth Generation, Harvest Planning - Ensuring Success, & Family Perseverance - Farm Restructuring. 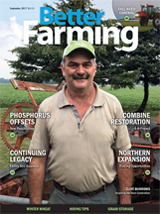 Better Farming September 2017 edition features Clint Burrows on the front cover and the following articles: Phosphorus Offsets - New Possibilities, Continuing Legacy - Family Sod Business, Combine Restoration - 4-H Project, & Northern Expansion - Finding Opportunities.